White Dog Blog: Treasure's Birthday! When I first saw her - on Petfinder. Happy Birthday to my wonderful girl, Treasure!! Three years ago, I drove to meet her and to bring her home. My heart already belonged to her, even though we had never met. I felt her already as a part of me. And I longed to be with her. When I first met her, my hands reached for her immediately. I tried to pull myself back a bit so I wouldn't startle her. In my mind, I imagined her, blind and deaf, being reached for and touched by someone who she didn't know, and being afraid. But as my hand touched her, it was immediately pulled in to her soft, white coat. I knew there was no need to worry. It all felt right, and somehow, all too familiar. Even though we were strangers. 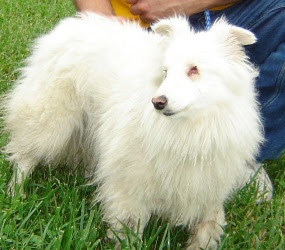 I never could have imagined what an amazing animal lived inside this fluffy white dog. Treasure had lived a very sheltered life. She hadn't been given much opportunity to show the world what she was capable of. When she came into my life, I had no expectations. I put no limits on Treasure. In my mind, there was nothing she couldn't do just because she was blind and deaf. Treasure took that attitude and has taken off to accomplish things that I never even would have imagined. She was quickly ready to take her therapy dog evaluation, which she passed with an advanced rating. And she began working her magic with everyone she met! She began a career as a Healing Touch for Animals ambassador from the very beginning, coming along with me to many classes and helping the students to learn new techniques. She has been an amazing spokesdog for specially-abled animals. We go together to do demonstrations and talks for various community groups. She is also spokesdog for Fluffy's Blankets, an organization that gifts special blankets and care packages for animals and their people in need of comfort and assistance. Treasure is a natural at the sport of k9 nosework. She searches for hidden odor - her nose still works great! She really loves this game! Treasure also went on to earn her Canine Good Citizen award, and a Novice Trick Dog title. She is continuing to work on new training projects all the time. She is always eager to learn new things - especially when there is a treat involved! Treasure is my stress relief after a rough day. She snuggles into my lap and I can feel my stress falling away. It's magic - Treasure's magic. It's what she's best at! Just being herself. Even after three years, I am still discovering wonderful new things about her every day. She is like a book full of possibilities. Stay tuned for more about her birthday celebration this weekend! Happy Birthday, beautiful girl! I love you and I hope we have many more birthdays together!